Hunting Torches are a great solution for hunters shooting at night time who don’t want to carry a separate searchlight or have a second person on hand all the time to hold a torch. Handheld spotlights are quickly becoming a thing of the past as the latest generation of led gun torches are a lot brighter and throw further. The new led torches are also a lot lighter in weight which make them much more suitable for mounting to rifles and shotguns. These new generation of long throwing torches come in many different sizes from lights like the klarus XT12GT gun kit which measures just over 6inches in length and is ideal for shooters wanting to keep their torch compact and still able to shoot at 150 meters -200 meters in distance. Then their are gun kits like the Klarus XT32 Kit and Olight M3XS javelot gun kit that are ideal for shooters wanting to throw a beam of light out to 500+ meters. Compact Gun light Kits choosing the biggest and baddest torch is all well and good but not everybody wants to shoot out to 400-500 meters at night time. A lot of hunters and farmers we speak to just want to shoot rabbits or foxes at a distance of 100m to 150m and have a nice light weight torch they can take on and off the gun easily and also use as a general purpose torch. In our opinion the best torch currently on the market for this application is the Klarus XT12GT gun kit. The torch is fully rechargeable comes with a rechargeable battery, charging cable and in the gun kit has all the mounts and accessories to set up on a rifle. The mounting system is a 2 piece aluminium system which is quick release so easy to take off in the field but because it is picatinny rail mounted is super secure and wont move during shots. 400 Meter+ Gun light Kits for hunters wanting a light that put a beam out to 500 meters or more their are a few kits available. These torches have a few things in common which enable them to have a super tight beam that can create a very high candela output which is required for distance. These kits are the the Klarus XT32 Gunkit and the Olight M3XS Gunkit. Both torches use a specially designed dedomed led chip for distance and also match this with a large deep highly polished reflector to create a very bright tight beam. These 2 gun kits are the most popular among shooters in Australia at the moment and are easily the longest throwing gun mounted torches out there. What is in the Gun Kits all our gun kits come with everything you need to get started. Each kit comes with the torch and all standard accessories and we also include all rechargeable batteries and chargers needed. We also include a tape switch which make it easy to turn the torch on and off while holding a rifle as it only requires you to place your thumb on the stock of the rifle and apply a little pressure and the torch will come on. we use a 2 piece aluminium mounting system in all our kits as they are the most secure mount on the market. 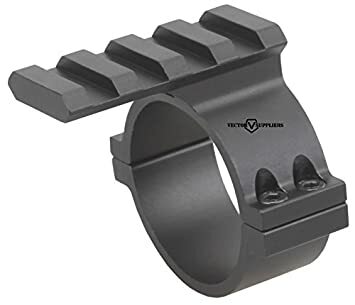 These mounts do cost a few more dollars but are well worth it as when they are set up on the rifle they will not move around during shots like a lot of traditional mounts. Types of Mounts their are several types of gun mounts available from our site other than the ones featured on our gun light page. Depending on your application choose whether you want to mount to a rifle or a shotgun scope mounted or barrel mounted. Scope Mounts are the perfect solution for rifle shooting when you want to mount your rifle on the scope for distributing the weight of the torch on the rifle. Barrel Mounts are ideal for mounting torches to the front of a rifle or shotgun using a standard torch with a 25mm body. We have specifically designed our gun kits to make the chore of picking your equipment easier and more cost effective. A silent remote pressure switch that replaces the original tail cap and is designed to be mounted in the most accessible place on your rifle with velcro tabs for effortless safe and efficient use of your gun. And an ARIA quick release gun mount that marries up to your scope to to help with weight distribution and will also adapt to any gun with existing mounting rails as well. The Klarus FH10 multi coloured gun kit is one of the most unique gun torches in our range. it has 3 colours white, green and red. What makes this light so unique is the fact that the beam can be focused to a fine point for long distance of spread to give a wider spread. The torch also has 3 separate coloured led so does not need to use a diffuser to create the colour which means the beam can throw a lot further. The green beam can throw a staggering 300+ meters which is very unique for a coloured flashlight. Red and green are great for hunting pigs or foxes as animals cannot pick up on these colours and do not get as spooked as they would when a bright white light is placed on them. Now these gadgets are for the guys who love their tech and for the Night Vision enthusiasts.